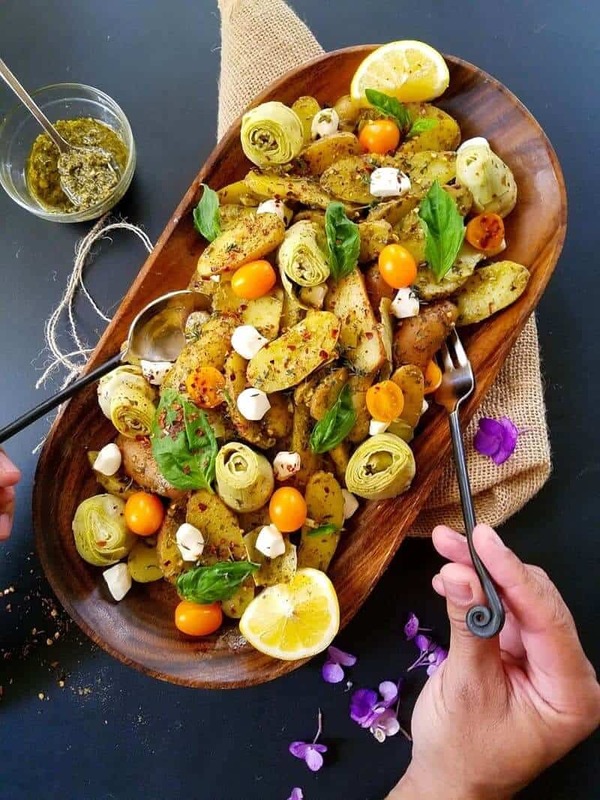 A 30-minute gluten-free, easy, and nutritious Spring Potato Salad made with mixed fingerling potatoes tossed with pesto sauce, fresh lemon juice, olive oil, bright spices, sweet tomatoes, artichokes, fresh mozzarella, and basil leaves. Disclosure: This is a compensated campaign in collaboration with the US Potato Board and Honest Cooking. Thank you for supporting the brands that I work with and love. Spring is almost here! Yay! To celebrate one of my favorite seasons I came up with this 30-minute, easy, and nutritious Spring Potato Salad that will be the talk of the meal. It is a true feast for the eyes… and palate! 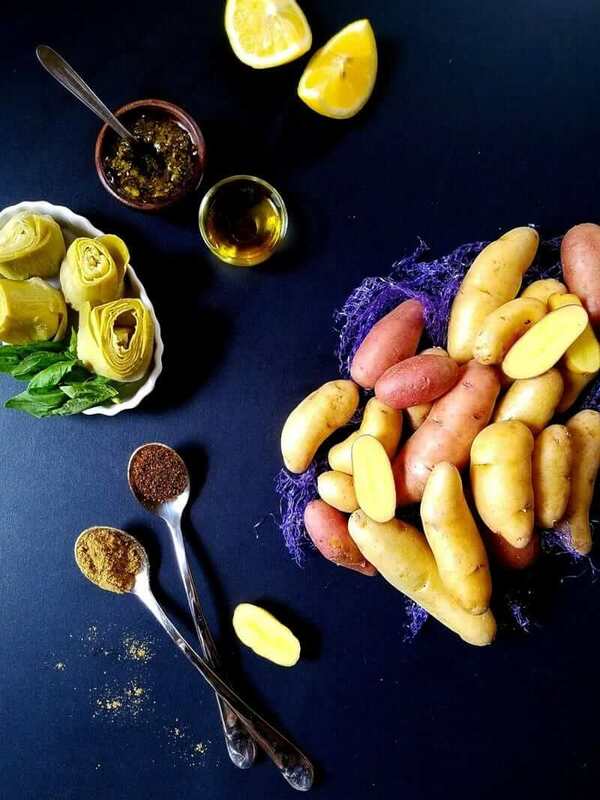 Our Spring Potato Salad is made with mixed fingerling potatoes tossed with pesto sauce, fresh lemon juice, olive oil, cumin, chili powder, and crushed red pepper. It is served chilled and features complimentary flavors from the sweet tomatoes, artichokes, fresh mozzarella, and basil leaves. It is quite simple to prepare, requiring no special cooking skills. All one has to do is to boil the potatoes, drain them, and then toss with all the other ingredients. See? Easy peasy! The result? A colorful, gluten-free dish to brighten your table! Of course, potatoes are the key ingredient in this dish… a universal and versatile starchy vegetable, full of vitamins and minerals. Needless to say, they pair well with almost anything, right? 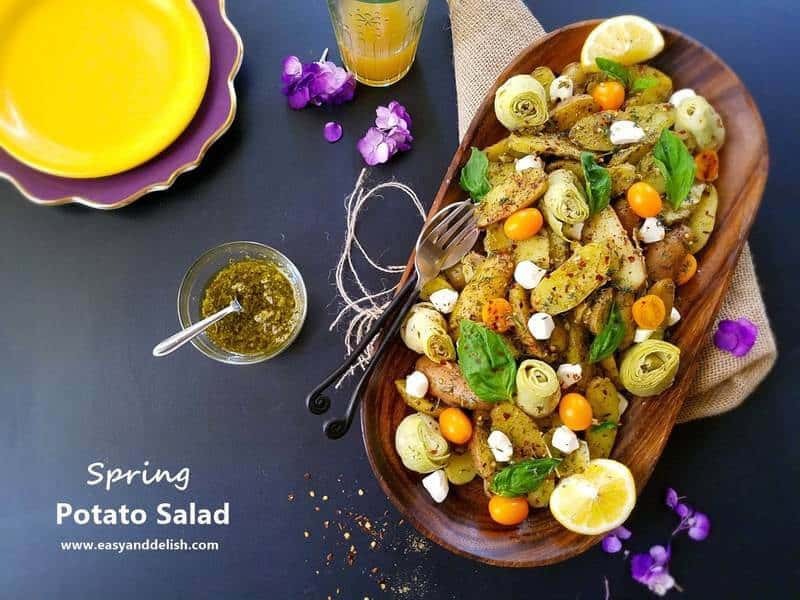 Our Spring Potato Salad is refreshing and full of bright flavors, making it the ideal side for barbecued or grilled meats, meatloaf, fish, and roasts. 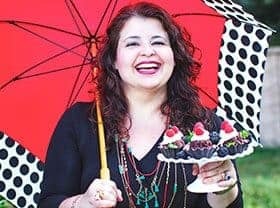 The spices that are in this salad give it an unusual kick and make it one of the tastiest salads that you can imagine. For more recipes like this and additional info, visit the US Potato Board website. Place potatoes in a large pot. Add enough cold water to cover by 3 inches. Stir in 1 tablespoon salt and bring to a boil. Reduce heat to medium and simmer until potatoes are tender, about 12-15 minutes. Drain in a colander and let cool slightly. Meanwhile, in a large bowl, whisk olive oil, lemon juice, 1/2 teaspoon salt, cumin, and chili powder until homogeneous. Stir in the crushed red pepper and pesto sauce, and mix well. Add potatoes and toss to coat. 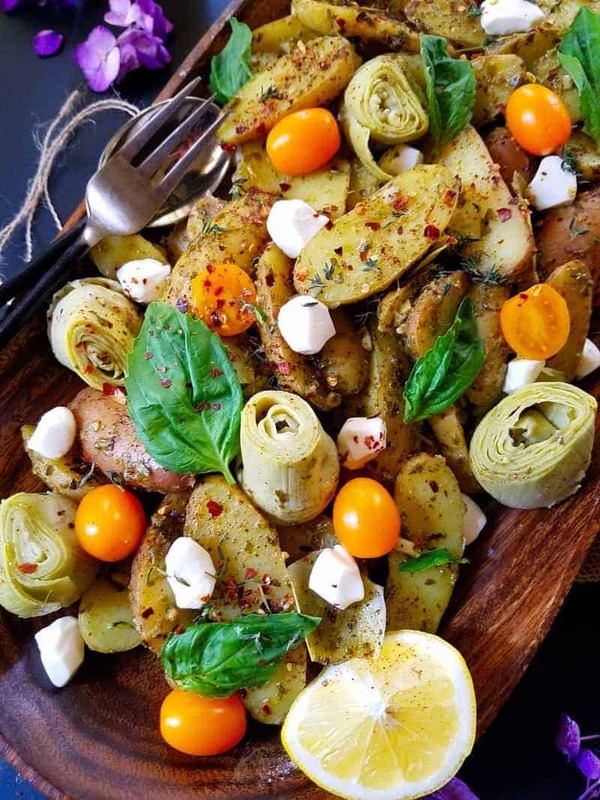 Place tossed potatoes onto a serving platter and arrange artichokes hearts, tomatoes, and mozzarella pearls on top and sides. Cover and chill in the refrigerator. Right before serving, garnish with basil leaves. Enjoy! This Spring Potato Salad can be made 1 day ahead. Oh I am so ready for spring! What a fabulous potato salad to jump start the season! Love potatoes. And love potato salad. This one is SO creative — you’ve really loaded this up with flavor. Super dish — thanks. 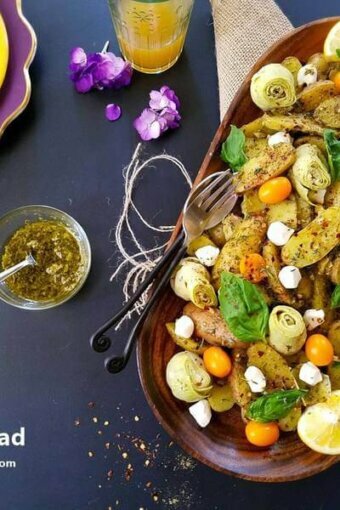 Your potato salad looks great Denise, I love the idea of using pesto sauce…and yes, looks perfect for spring! Springtime there autumn here, I am jealous. I often make a roasted chicken “Italian style” and your delicious salad would go perfect with it.